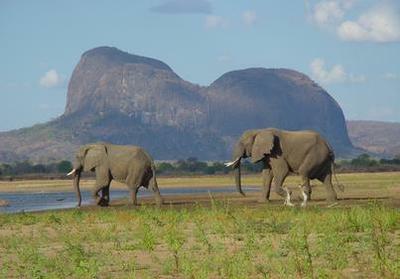 Lugenda Wilderness Camp, in the Niassa Reserve on the eastern bank of the Lugenda River in northern Mozambique, opened May 1st for the 2013 season. October and November are prime birding months and with Lugenda's varied terrain there are more than 370 species to view including the rare Angola pitta (Pitta angolensis), Pel's fishing owl (Scotopelia peli), and an abundant raptor population. For those who want more than bird watching, the reserve - bordering with Tanzania - is one of the largest protected Miombo forest ecosystems in the world. It covers an area of 42,000km², and supports the greatest concentration of wildlife in the country. Game drives, canoeing and bush walks to view the varied and prolific wildlife - that includes four of the Big Five as well as the endangered African wild dog - are the many activities offered here. Under the bush-wise hands of the seasoned guides, Lugenda offers the serious wildlife enthusiast as well as the inspiration-seeking solo explorer a variety of experiences to be discovered between the riverbanks, the Miombo woodlands and the giant granite inselbergs. Back at the lodge, simple, warm and luxurious comfort dictates the accommodation: the camp sleeps a maximum of 16 people in 8 East African safari tents, with classic four poster beds, overhead fans, soft wooden floors strewn with Persian carpets, large and airy showers, Victorian baths and private viewing decks. The tents are beneath large, wild-fig trees that attract elephant in the early mornings and late afternoons. Leisurely meals are enjoyed in the open-sided dining area around a solid natural wood table, where guests relax together and chat about the unique experiences that Lugenda provides. Among which include: an unforgettable climb to reach a hidden cave to see original Batwa pygmy paintings; meandering down the Lugenda River for a canoeing safari drifting between hippo and crocs, wide waters and gentle rapids, stopping for a chat with local fishermen and a quick plunge in natural, ice cold spa baths that form between the rocks; followed by a riverside dinner by lamplight and a deep sleep in tents beside the hippo pools - all accompanied by expert guides who are passionate about sharing their knowledge, creating an extraordinary experience to be treasured for a lifetime. Lugenda manages to seamlessly interweave the fantasy of travel and faraway, unfamiliar places and new experiences with a hospitality that doesn't feel like home. It feels like being in the warm and happily predictable company of lifelong friends. All of the staff at Lugenda have spent their lives in the African wilds and their deep love of their vocations and their environment is easily and generously shared with guests whether on bush walks, around the bar or boma, or lying on one's back beside the river, stargazing. For ease of entry Lugenda also has its own airstrip, with fly-in access from Pemba International Airport; with flights connecting from Dar es Salaam, Maputo and Johannesburg into Pemba, Mozambique. For all reservation enquiries, visit raniresorts.com.